Get Involved | Historic Cabarrus Association, Inc.
Come join us! Volunteers are instrumental to the operation of the Concord Museum and the Veterans Museum. By volunteering with Historic Cabarrus Association, you can learn more about history, meet new people, share information, and make a valuable contribution to the communities of Cabarrus County. 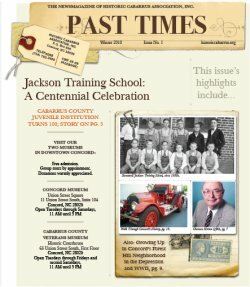 You will get the opportunity to work hands-on with historical artifacts and documents as old as the founding of Cabarrus County and share information about the communities of this county and its residents. Become a volunteer and help keep Cabarrus County’s heritage and history alive! Contact Ashley Sedlak-Propst, Executive Director and Volunteer Coordinator by phone 704-920-2465 or by email historiccabarrus@gmail.com to find out more about volunteer opportunities with Historic Cabarrus Association. Volunteer positions are open to all individuals who meet the qualifications, without regard to race, color, religion, gender, sexual orientation, national origin, age, or disability.